I depend on the kindness of strangers to pursue my quest for the cutting edge in the nation’s school food. After settling on Boulder as my next stop, I had to wonder where I would stay. A self-funded journalist has to think about these things. To the rescue came my editor at Grist, Bonnie Azab Powell. “What, am I your travel agent now?” she queried. Bonnie connected me to fellow Grist writer Lou Bendrick. 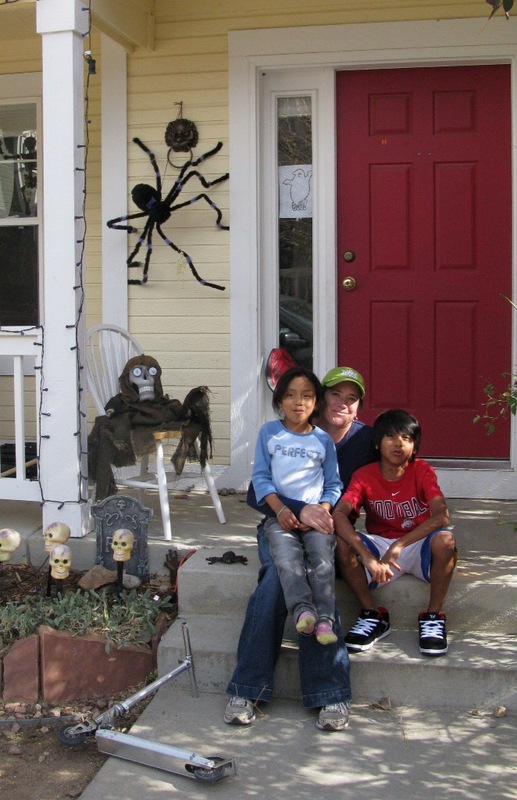 Lou, her husband Hal and their two children live in a “New Urbanism” community on the north side of Boulder. I describe it as being kibbutz-like, with town homes tightly clustered around a green area the kids use as a play ground. There’s also a “common house” with a commercial-size kitchen and entertainment area. The house also happens to have two guest rooms and laundry facilities. Lou checked the calendar for the guest rooms and I was in luck. I would be able to bunk there four of the nights I was scheduled to stay in Boulder. But that left three nights unaccounted for. I had visions of sleeping in my rental car. A couple of readers suggested “couch surfing.” I thought they were pulling my leg. But I would soon learn that while I apparently was looking elsewhere, an international organization had sprung up on the internet whereby travelers–or perhaps just people who dream of traveling–agree to host people like me on their couches or in their spare bedrooms. After I signed up, I was shocked to find that dozens of Boulder residents list themselves as potential hosts. One of the first to reply to my request was Sue Detling, a software engineer for a non-profit group that studies tornadoes and thunderstorms. I found a note on the front door when I arrived, giving directions to a cozy room and the fridge. Sue has two kids in Boulder schools but wasn’t keen on the school food ever since she saw hot dogs on the menu. But she also happened to be friends with one of the chefs I would later write about in my series: Brandy Dreibelbis, the former executive chef for the Boulder Whole Foods. My first night in Boulder, we all had dinner together at Sue’s place and Brandy began to fill me in on the food revolution taking place in Boulder schools. The next day was Halloween. I spent the morning walking a trail along The Front Range where I stumbled upon a massive colony of prairie dogs. The trail normally leads to a lake, but the path was blocked by a helicopter involved in fighting a nearby forest fire and using the lake to load buckets of water. 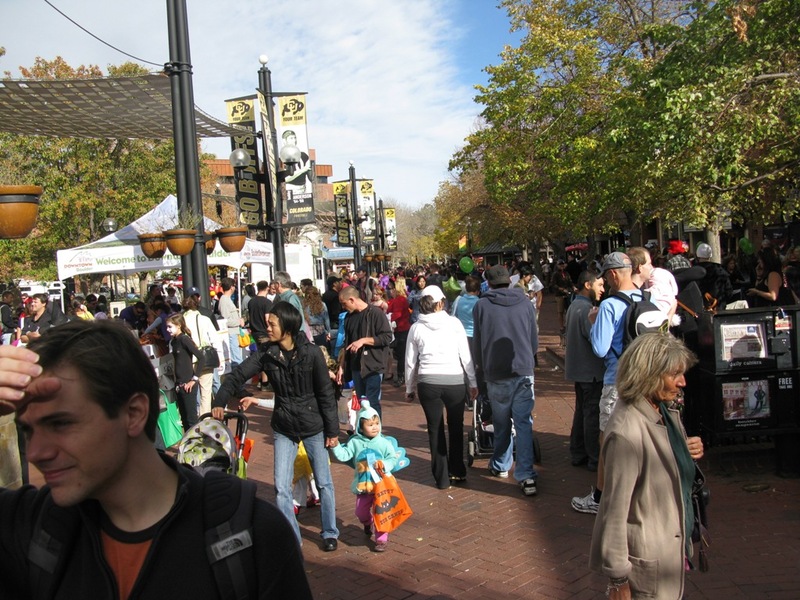 Halloween traditionally is a crazy time in Boulder. I passed the afternoon on the Pearl Street Mall, a stretch of downtown that’s been closed to traffic. Before long, it was mobbed with kids in wild customes, to go along with musicians of all sorts playing for coins. I spent the next two nights with “couch surfing” hosts Ben and Heather Ridge. In yet another remarkable coincidence, Heather is the horticulture instructor at Arapahoe Ridge High School next to the school district headquarters where I would spend considerable time. I helped chop celery for salad bars at Arapahoe Ridge and conducted a couple of important interviews there. Heather and I spent plenty of time talking gardening–she was still harvesting greens out of the food garden in her back yard–as well as her insider view of the local schools and especially the school food. Ann Cooper was apprehensive about me visiting her food operation in Boulder because she was still in the middle of re-making it. I don’t think she need have been concerned. From what I could see, things were well organized. This was a rare snapshot of a school food system evolving in real time. Because I moved around between so many different schools from day to day–one elementary school, one middle school and two high schools–this series lacks the sense of intimacy that I was able to convey in the two previous series I wrote from D.C. and Berkeley, where I was confined to a single kitchen. Still, Cooper had given me unlimited access to explore the facilities and talk to her personnel. I was under no restrictions whatsoever, except that I did not photograph children’s faces out of privacy concerns. I have plenty of photos left to share, such as this one of the gleaming new kitchen at the refurbished Casey Middle School. Apparently, school districts often are on automatic pilot when it comes to building kitchens. Ann Cooper and her business partner Beth Collins, in conducting a study of the Boulder food operations, found that the district was continuing to install full-service kitchens even though there were no plans to use them as such. 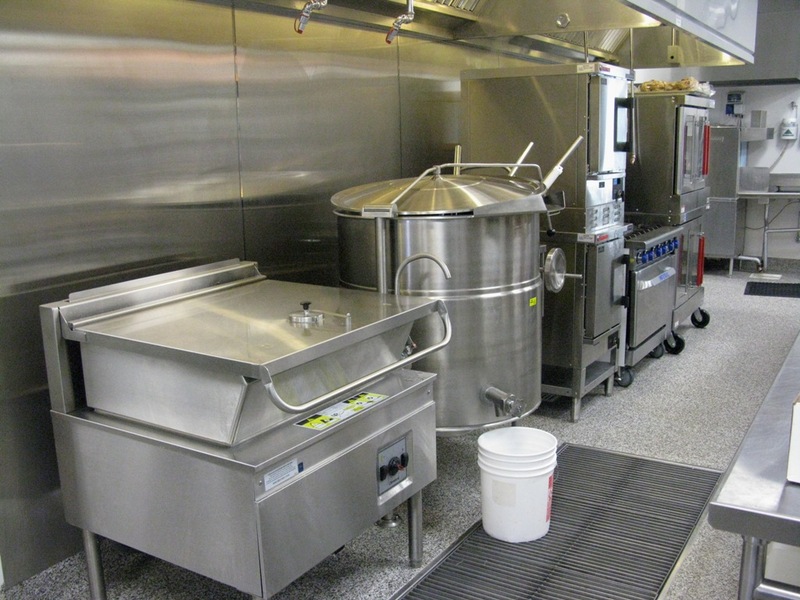 In the case of Casey Middle School, Collins caught the kitchen rehab before it was finished and was able to change the design to include equipment that would turn the facility into one of the five production kitchens she and Cooper had in mind for the district. Here you see the 80-gallon kettle that Cooper envisions cooking the soup for Boulder schools this winter. 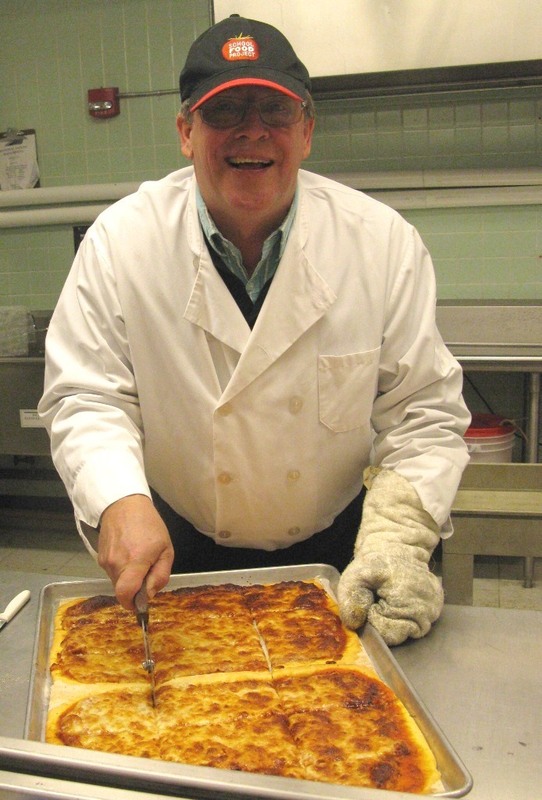 Each production kitchen serves eight or nine schools and together they prepare about 7,500 lunches daily. 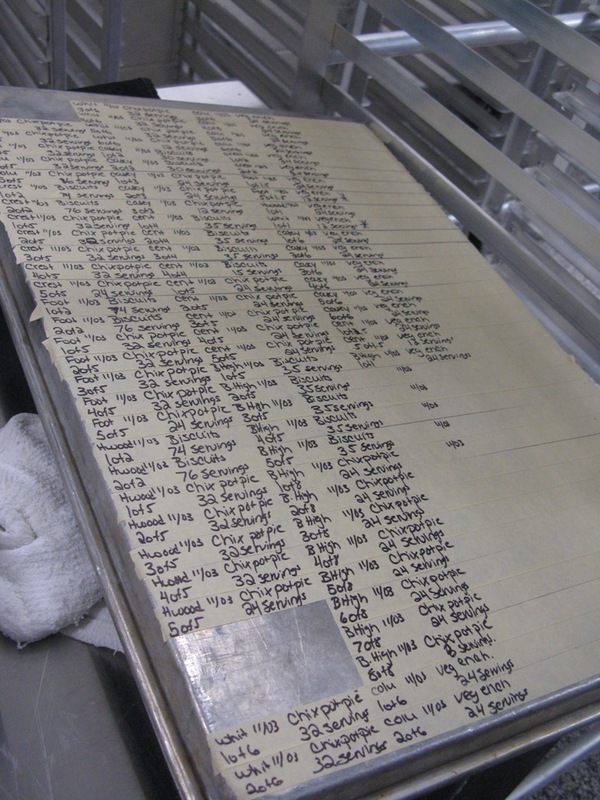 To keep track of all the food leaving the production sites, the chefs make labels using masking tape on the back of a sheet pan. Here’s what it looks like before the chef scores the tape with a utility knife to create the individual labels. 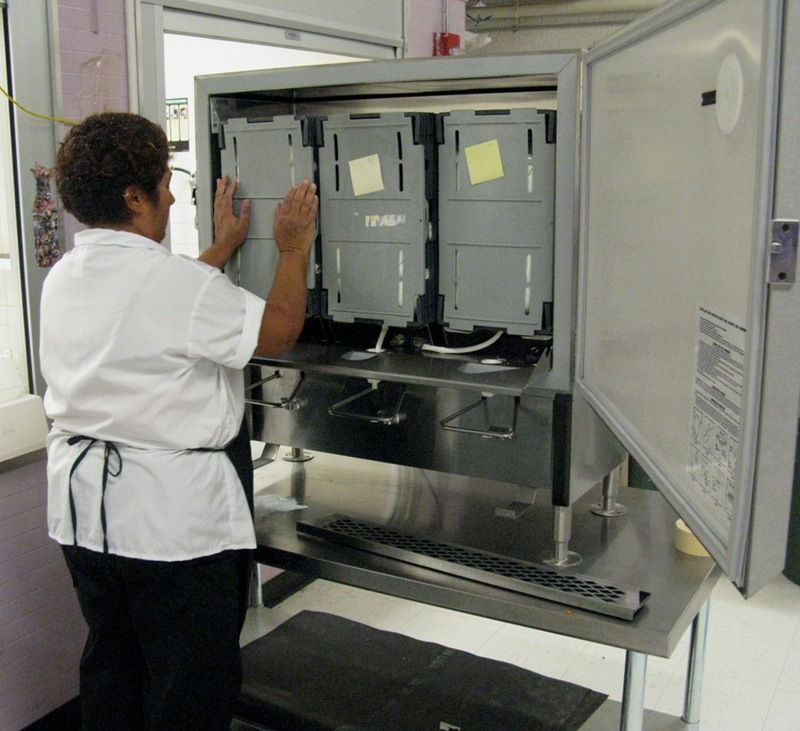 Food is loaded onto tall aluminum rolling racks or into insulated cabinets for shipment to outlying school “satellite kitchens,” where it’s usually reheated the next day and served to students. This was another innovation by Cooper and Collins. Previously, Boulder’s school kitchens were totally dependent on drivers from the district’s central warehouse for food deliveries. But the warehouse and kitchen schedules didn’t align, and often the trucks drove empty after making a delivery. 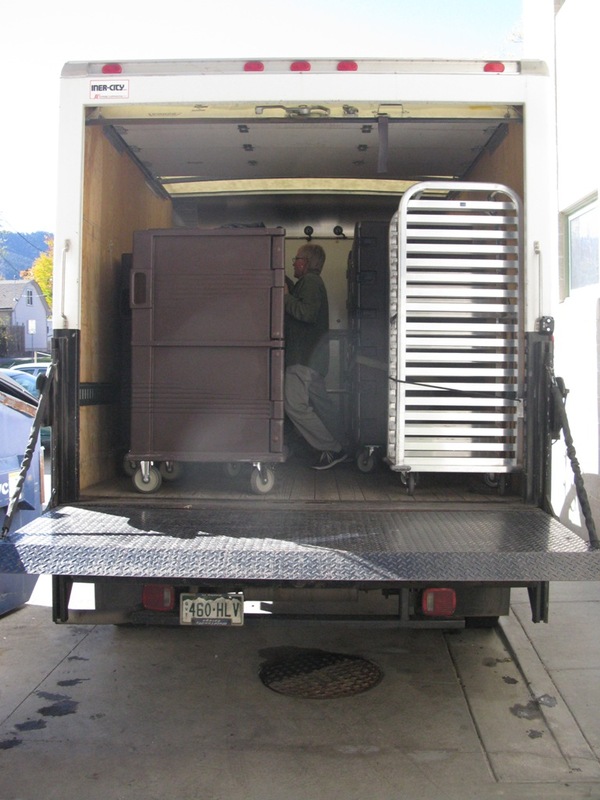 Now, the food services department manages its own fleet of six trucks to move food around the 500 square miles encompassing the Boulder Valley School District. Try as I might, I could not find a logical place in the series to talk about food service in Boulder’s high schools. High schools present their own issues, since most teenagers apparently would just as soon spend their lunch hours somewhere other than in a cafeteria. Of the seven high schools in Boulder, five are “open campus,” meaning kids can leave school grounds at lunch time. Some hang out around campus, others drive off to the nearest fast-food joint for lunch. This was my first visit to a high school cafeteria since I was in high school, oh, about a century ago. I was impressed by the array of vending machines I found in the lunch room at Monarch High School, selling all kinds of snacks, fruit juices and sports drinks. 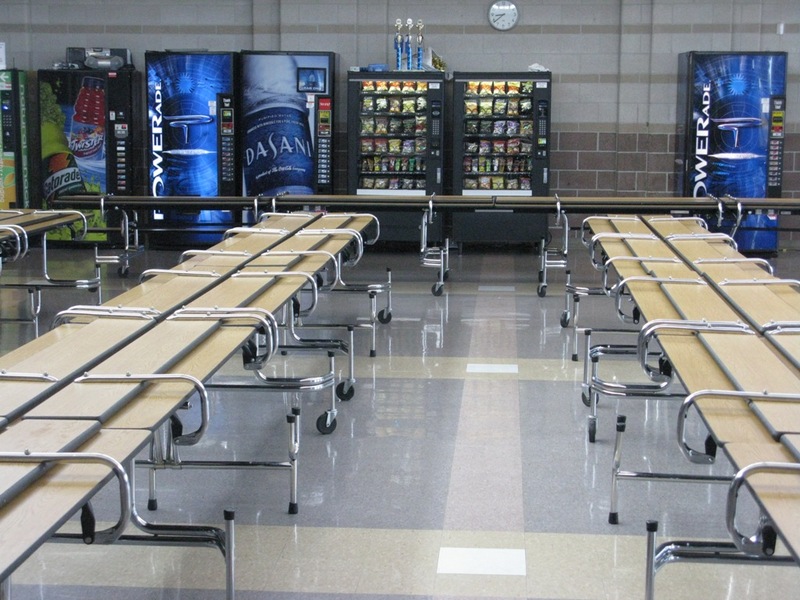 Vending machines can occupy the same space as the federally-subsidized meal line as long as the proceeds accrue to the lunch program. 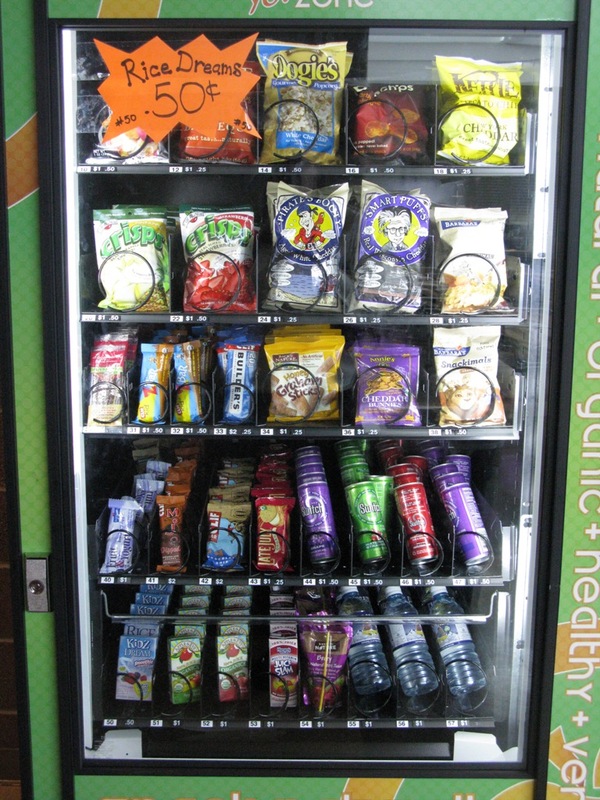 Boulder adheres to a policy that the foods in vending machines may not contain more than 35 percent fat, or 10 percent trans fats, or 35 percent sugar by weight. Ann Cooper has introduced a new wellness policy for the district that would eliminate food additives, colorings, growth hormones, irradiation, hydrogenated oils, high fructose corn syrup, and genetically modified foods. 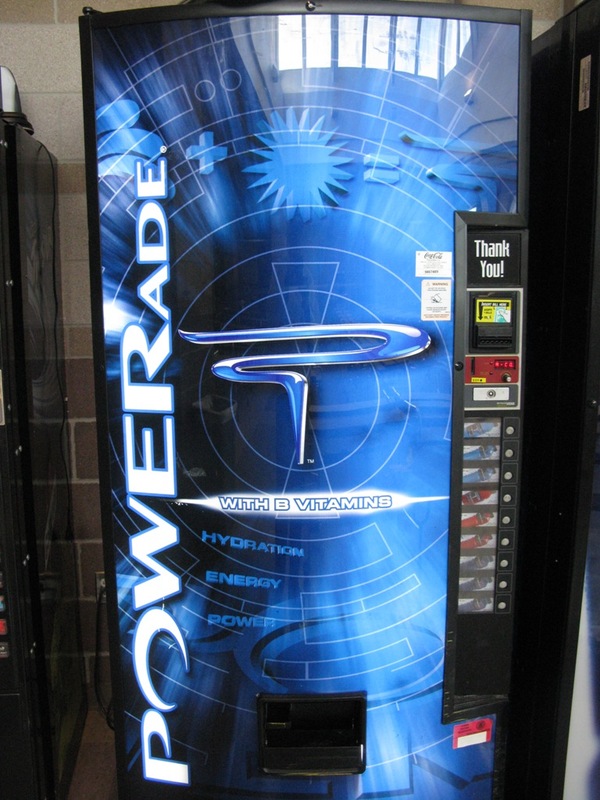 Vending machines in secondary schools would not only have to comply with the local wellness policy and state and federal guidelines, but would have to be approved and certified by the district’s nutrition services department. 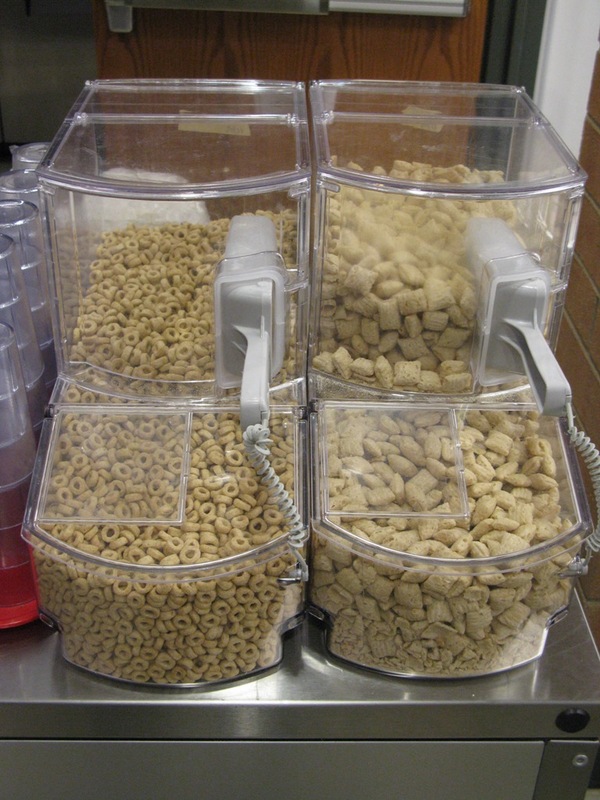 “Until Ann got here, nobody wanted to take on vending machines,” said Deb McCormick, a nutritionist with the school district who is now one of five food services district managers. 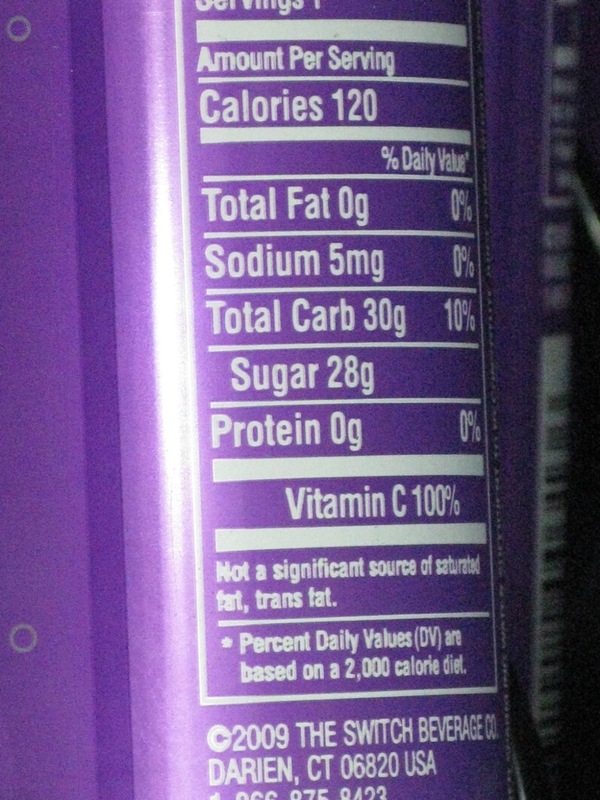 This particular juice contains more sugar, ounce-for-ounce, than Mountain Dew. There are other fascinating aspects of high school cafeteria life. For instance, high school students seem to regard real silverware and re-usable plates as disposable. Sometimes they take plates to their cars to eat and simply leave them in the parking lot. Or they will throw silverware in the trash. 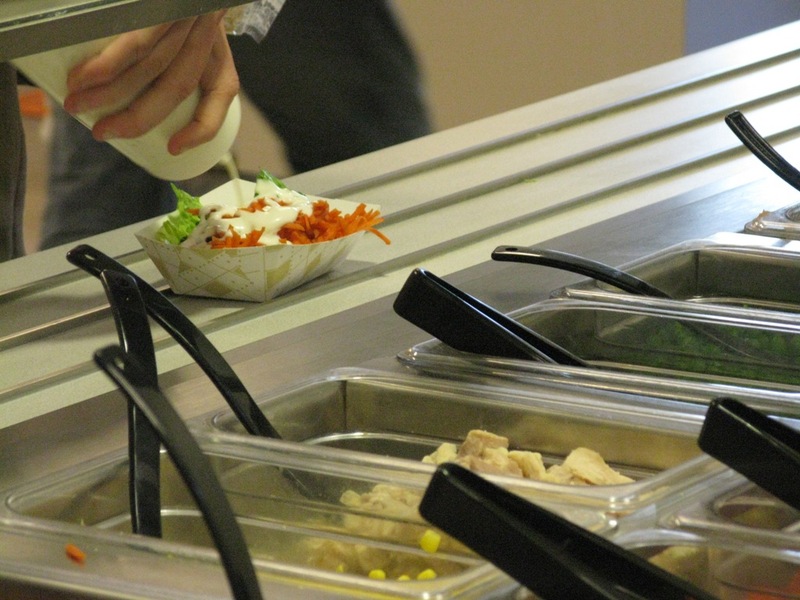 Consequently, in most high schools the food is served in paper “boats” with plastic utensils, as you see here at the salad bar at Monarch High School. The boats come in two sizes, small and large, so you can fit an entire meal in one. And students are welcome to come back to the salad bar for second or third helpings. I also thought the cereal dispensers on display at the cash register for breakfast at Arapahoe Ridge High School were clever. But for cleverness, you can’t beat the students themselves. Look how they load a drink glass with cereal. They then cover it with cold, organic milk from a dispenser. 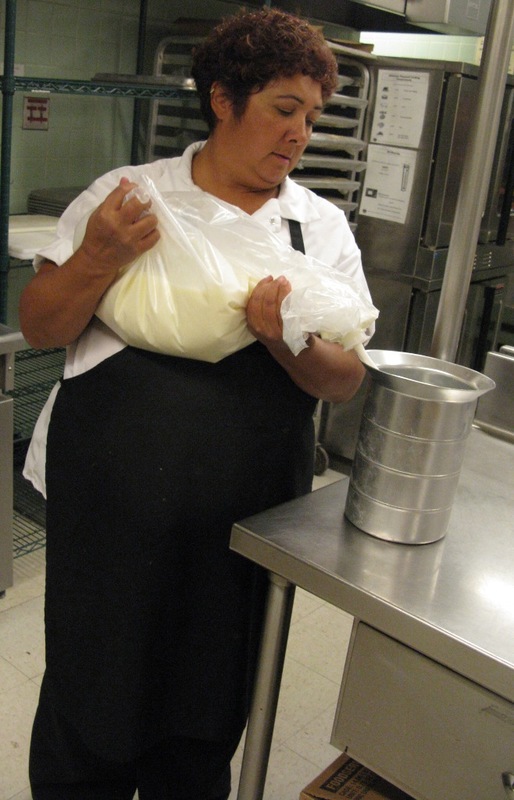 Milk is delivered in five-gallon plastic bags. For kindergartners, its poured into pitchers and served at the table. Otherwise the bags are loaded into an electric cooler for self-service. Cooper doesn’t believe in flavored milk because of the added sugar. “Kids were so disappointed when they couldn’t have their chocolate milk. They died,” said Margaret Trervarton, the “kitchen lead” at Columbine Elementary School. One point in the series needs to be clarified. On day two, I dealt with steps schools have taken to remove the stigma some students feel eating meals from the subsidized food line. 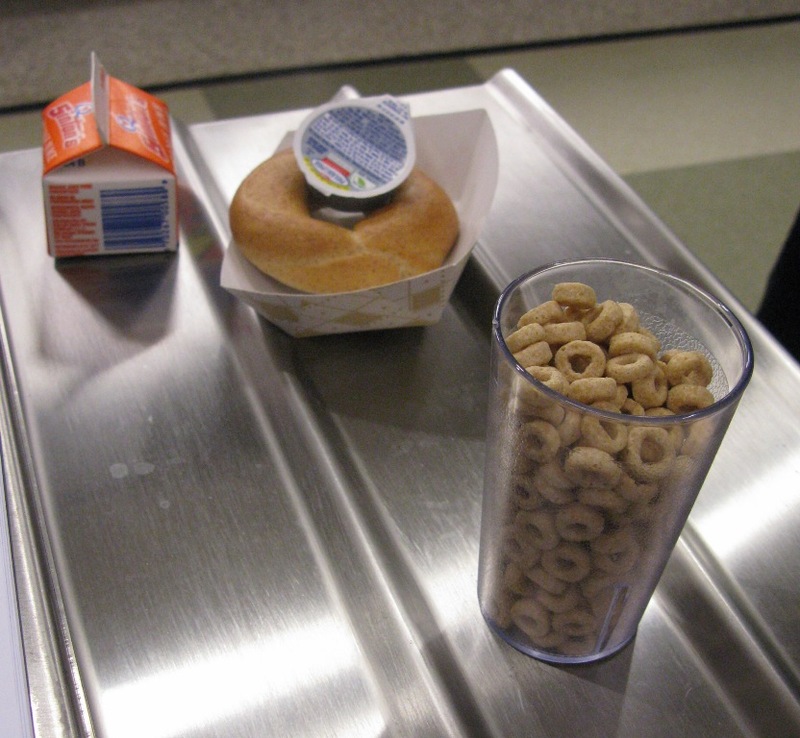 The U.S. Department of Agriculture, which overseas the national lunch program, prohibits schools from operating separate food lines, one for subsidized meals, another for so-called a la carte food items. 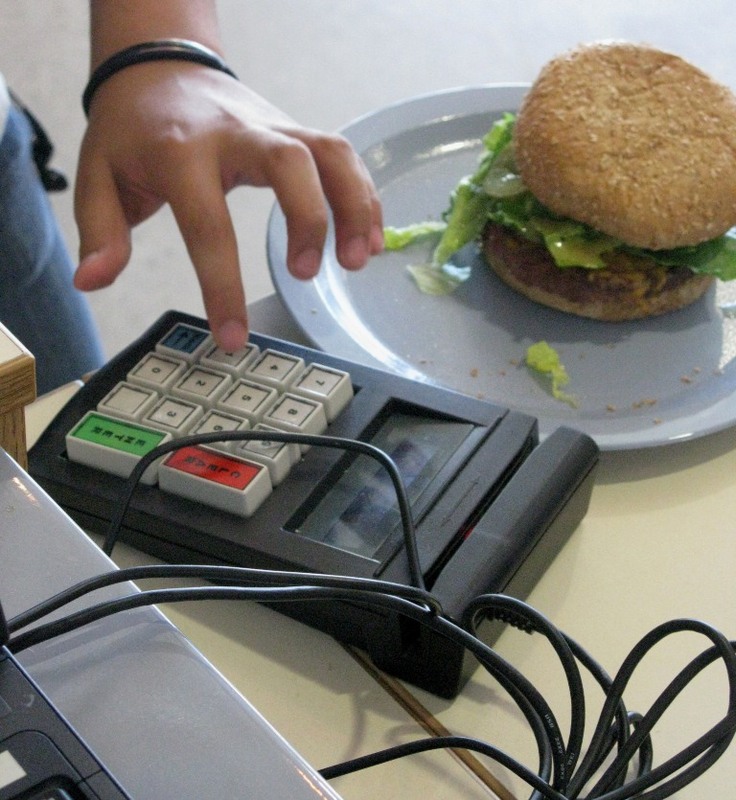 Many schools have also purchased point of sale hardware that allows students to enter a personal identification number when they exit the food line so that no cash changes hands. Computer software identifies the students who are entitled to free or reduced-price meals. After I published this piece, a fellow food blogger contacted me in alarm, saying this could not be true because her school district–a very large one–operates separate food lines. I thought I had this regulation firmly implanted in my head. But when I went back through the USDA rules looking for it, I couldn’t find it. I removed this passage from the article on the two blogs I manage as well as at Grist, where the series is being re-published. Subsequently, I contacted the USDA civil rights division and was assured that, yes, my original version was correct. 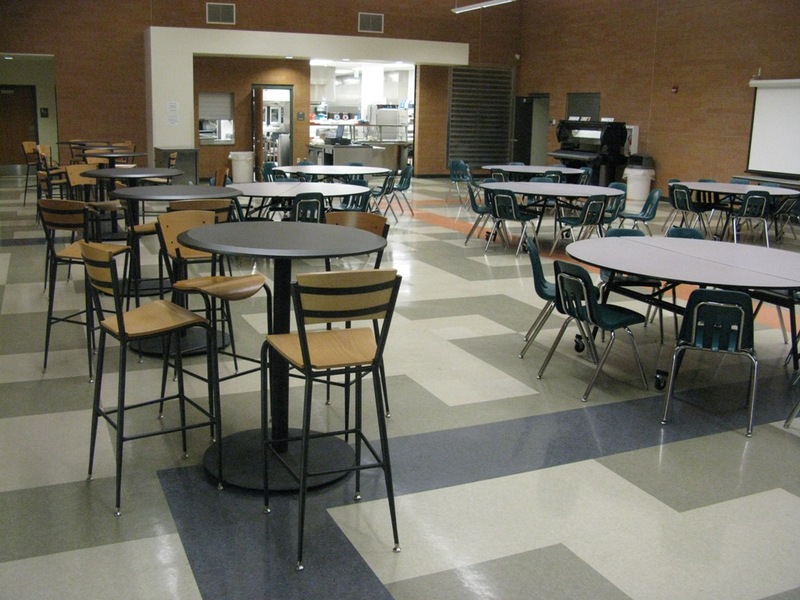 Schools may not operate separate lines for subsidized meals. Here is a link to the regulations in question [PDF], specifically section 245.8 on page 328. Update: Nov. 23, a spokeperson for the USDA’s Food and Nutrition Services division, which oversees school meals, said schools may operate separate food lines, one for subsidized meals and another for a la carte items. The whole series has been fantastic and I’ve read it from start to finish with keen interest. I’m sorry I haven’t mentioned it earlier on my blog — I will today. I think that many people aren’t at their computers this week. Mrs. Q, I am so gratified to know you’ve been following along. The school food quagmire can really use enterprising journalism like this, I think, but only if people actually read it. Your support is much appreciated. Feel like I’ve gotten to know ’em. So much to learn. Thanks for this series, Ed. Wow! What wonderful articles. My mom is a lunchlady and she constantly voicing her frustrations about the meals she has to serve. Unfortunatly her district is small and poor so I don’t forsee any food revolutions occuring there anytime soon (in fact they just had some budget cuts!). I am going to pass this along to my Mom though because I am sure she would be interested. Thanks for the great info!